Live Kabuki Comes Back to USA this Summer! A warm thought to help heat you up during the chilly Northern California winter: real, live Kabuki is coming back to America this summer! For those on the West Coast, it will mean a trip to New York, which is nonetheless closer and cheaper than Japan. If you were ever curious about Kabuki and have the means, you might want to take advantage of the opportunity to see the “real thing” here in the U.S. The performance is part of a very interesting project called “Heisei Nakamura-za,” which was started about a decade ago by the late, great Kabuki actor Nakamura Kanzaburo, who passed away unexpectedly about a year ago. Kanzaburo wanted to give audiences the chance to experience Kabuki the way it used to be in the “golden days” of the Edo period. Back then, Kabuki was a popular entertainment for the common people. It featured smaller theaters, a more intimate relationship between actor and audience, and a more festive, raucous feel. So Kanzaburo started constructing temporary theaters in Japan and around the world that reflected this atmosphere. He extended the mood to the plays he staged, putting a contemporary spin on old classics. In 2012, I was fortunate enough to be able to see Kanzaburo perform in the last Heisei Nakamura-za theater he constructed, in Tokyo’s Asakusa district. It was an unforgettable experience. Some of the best actors of our day were walking a couple feet away from me on the theater’s modest hanamichi runway. A special energy flowed between the actors and the audience that I hadn’t felt at established Kabuki theaters. At the end of the final play, the entire back wall of the theater disappeared and we enjoyed a beautiful, open-air night view of the Sumidagawa River and the newly constructed Skytree Tower. It was a magical evening. Also performing is Kankuro’s younger brother, Shichinosuke, who is one of the most talented and beautiful onnagata female role specialists on stage today (he played Emperor Meiji in The Last Samurai). One of my favorite Kabuki actors, Nakamura Shido, will also appear. You may recognize him from Letters from Iwo Jima. 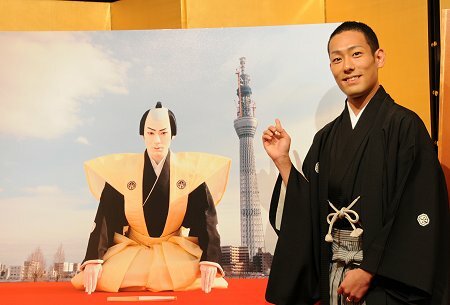 He is known as a kind of “punk,” “bad-boy” Kabuki actor of the younger generation (though in typical Japanese fashion he is also dedicated to humbly learning the traditional techniques from his seniors). It might be a little crazy to plan a trip to New York just to see Kabuki, but the fact that this is a rare chance to see live Kabuki in the U.S. might be enough of a good reason to go! For those of you who are interested in finding out more about Kabuki and Japanese performing arts, I encourage you to join JETAANC’s Kabuki Club, a fun group of alumni and friends who meet regularly to watch and learn about Japanese performing arts. Visit JETAANC’s Kabuki Club website to learn more. The website is also one of the best English-language resources for Kabuki and Japanese performing arts.